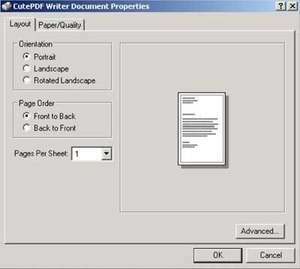 CutePDF Writer is a virtual printer for PDF files. It installs in minutes and automatically configures the virtual printer, you'll see in the Printers folder under the name of CutePDF Writer. Unlike the Professional version, CutePDF Writer Free doesn't contain many of the features which professional software might; that means no fancy options or a control panel. The only thing which CutePDF Writer includes is the save dialog box. Version 3.2.0.1 is a freeware program which does not have restrictions and it's free so it doesn't cost anything. For security reasons, you should also check out the CutePDF Writer download at LO4D.com which includes virus and malware tests. Additional screenshots of this application download may be available, too. CutePDF Writer has a presence on social networks. CutePDF Writer download been highly rated by our users.